I grew up in a Jewish family with two parents from New York. This means deli was something we were used to, and something we did not take lightly. We grew up frequenting B.J. Pumpernickel's in Olney, Maryland, and we always made a trip to The Gourmet Deli House when visiting my grandparents in Florida. But, nothing beats a New York Deli. Katz's, Carnegie, and the Stage Deli are just a few of the famous ones that are known for their corned beef sandwiches, matzo ball soup, and potato latkes. These are the classics I crave, and the classics we are unable to get here in the Washington area as we are seriously missing the presence of a good Jewish deli. The news broke last year that Chef Barry Koslow would be behind the new DGS Delicatessan opening in Dupont Circle which would serve "modern" takes on traditional classics. DGS has been honest from the get-go, and it is unfair for anyone to walk in expecting a simple potato knish, but I still found myself longing for the basics that I grew up eating with my parents and grandparents. The evening started with a waiter who I would refer to as "pusher." He took some very strong stances early on about what we should order, or better yet, what we shouldn't order. I cannot eat mustard and was sure to ask when ordering the lamb knish with potato and lentils if the condiment was served on the side. I was assured that it was, and when the plate was delivered the small sized knish was seated on top of two huge globs of mustard. He still stood by his take of it being "on the side", but did return it to the kitchen to deliver us one with the condiments properly served on the side. While the original hiccup wasn't ideal, the knish itself was salty and delicious. The lamb merguez with the lentils and potato created a soft and hot inside with a firm yet slightly doughy outside. I loved the flavors and appreciated this unique take on the knish. They will be opening a casual grab and go sandwich shop downstairs that will have a slightly different menu. Brunch will be starting up soon and will feature items such as a smoked salmon platter and matzo brei. After our knish we focused our attention to the entrees and I went with the waiter's recommendation for the kreplach stuffed with bacalao, tomatoes, garlic, and spices. Nikki attempted to order the eggplant Reuben but was immediately told not to, and to instead go for the meat-- so she opted for the corned beef Reuben instead. I always appreciate a good recommendation from the waiter, but this was more of a mandate. Turns out the waiter won this round though because the corned beef Reuben was the star of the show. While the sandwich is not plentiful or heaping as you would see in a New York style deli, it is well balanced and the flavors were spot-on. The corned beef, Gruyere, sauerkraut, and Russian on baked rye was impressive, hearty, and exactly what I will order next time I dine at DGS. The kreplach for me was a nice dish with a light and flavorful sauce and a compelling blend of spices, but I found the salted cod to be a bit overpowering. Things might have not been off to a perfect start, but we were determined to close on a high note. The dessert menu did not offer my favorite which is a black and white cookie, but the options were pretty mouthwatering. So much so that we ordered two desserts for the table: the sweet noodle kugel with salted caramel ice cream and the babka bread pudding with cinnamon ice cream. I did not love the creamy consistency of the noodle kugel nor was I totally taken with the citrus zest flavoring, but let's just say that every doubt and concern was erased after my first bite into the babka bread pudding. Wow. This dessert is special. 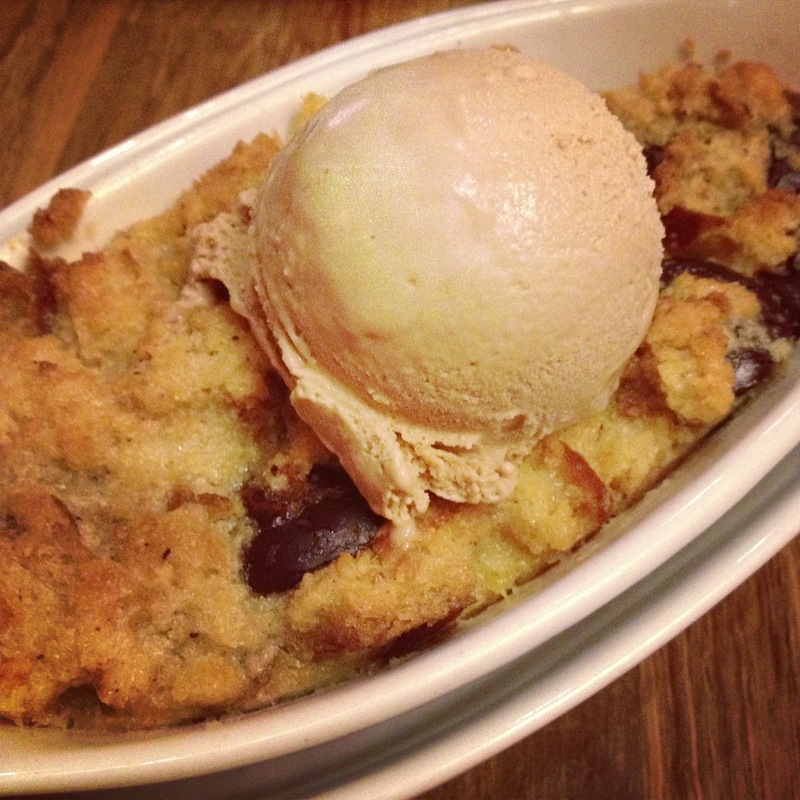 Hot doughy bread pudding with chunks of chocolate and cold ice cream melting down the sides of the dish. It was one of the best desserts I have had in a long time and I will not let anyone eat at DGS without ordering this dish to top off their meal. The meal at DGS had some high notes and low notes, but I'll admit that the majority of the misses were logistical/front of house issues that can be worked out as time goes by. Portion sizes could be larger, but I give Barry a lot of credit for taking such a big risk to try and disrupt known favorites and give them interesting new twists. It takes guts and confidence to do what is happening over at DGS, and I have a feeling they will find their footing and also find some loyal customers along the way.